Discover Taman Rahasia, a Secret Garden in Bali, nestled in the quaint artist's village of Penestanan, Ubud. Small and intimate, Taman Rahasia Boutique Resort & Spa is just 1.5 kilometers from central Ubud, the “cultural heart” of Bali, with its many museums, galleries, boutique shops and dining attractions. Taman Rahasia is also ideally situated to explore Bali's numerous natural and cultural attractions, all within a convenient day-trip. 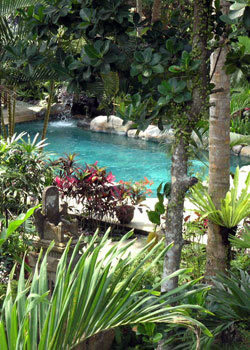 At Taman Rahasia you will find a haven embraced by nature where tranquil pleasures await. Eight comfortably appointed hotel rooms reside among lush gardens, towering coconut palms and rustling bamboo groves. The tropical air is infused with the sounds and scents of nature. Each room features a private bathroom and verandah or balcony with pool and garden views for the lazy afternoon retreat. Perfect Bali accommodation - a hotel resort with unique Balinese charm. Lounge in the sun or enjoy a refreshing dip at our inviting natural stone paved pool. Find total relaxation and contentment in our spa, offering aromatic custom-blended natural ingredients. Taman Rahasia's full range of spa services will revive your senses and melt away your stresses. Full breakfast is served daily. For lunch & dinner, delivery service is available from our off-site restaurant, The West End Café, offering an extensive menu of delicious Western & Indonesian dishes. Our intimate size ensures you enjoy personalized care and professional service with your ultimate comfort in mind. For the discerning traveler, Taman Rahasia is a little jewel of a hotel where we do everything with an extra measure of care and personal attention. The unforgettable Bali experience awaits you at Taman Rahasia Boutique Resort & Spa.